Among the great devotees of Lord Shiva, the one that is embedded deep in the heart of many Indians (especially from the South) is the story of Kannappa. The story is a legend which is often heard from the grandparents as a bedtime story in the states of Karnataka, Andhra Pradesh and Tamil Nadu. Such is the story that it was made into a Kannada movie, Bedara Kannappa ('The Hunter Kannappa'), which was one of the early movies to run in theaters for more than 100 days. The inspiration that one derives from the story is tremendous. It is worth reliving it not only during Shivarathri but at any time of the year. However, with the Mahashivarathri arriving upon us, it would indeed be a blessed experience to examine this story and its message. Like most of the legends we hear to, there are many versions to this story too. However, the spirit of love and devotion to the Lord is common across all the versions. The protagonist, our hero, is a young tribal hunter lad, Kannappa, who lived in the hills surrounding the now famous Sri Kalahasti Shiva temple. As a teenager, Kannappa proved to be a kind of rebel child. He questioned the reason behind animal sacrifices done to propitiate the Goddess. His reasoning was simple – killing for the sake of satiating the stomach is understandable and is prevalent in Nature too. But killing for the sake of propitiating an ‘unseen’ Goddess was unacceptable. In fact, he advocated the killing of ‘animal’ tendencies instead. Such bold questioning got him thrown outside his tribe and he began to live separately with a small band of ‘followers’ - those that were inspired by his thinking. There is a practice of sacrificing innocent and dumb animals such as goats, sheep, etc., on this day in the name of yajna and yaga. One day, a noble soul noticed some animals being taken in a grand procession. On enquiry, he was informed that they were being taken to the sacrificial altar. He asked the owner of the animals what benefit was derived from sacrificing the animals. The reply was that these ‘blessed’ animals would attain liberation as a result of being offered to God! That settles the issue of sacrifice as far as our Bhagawan is concerned. Moving along our story, it was during this time that the most important event of his life occurred. Kannappa, while on his daily hunt, came across a temple of Lord Shiva. Entering the temple, he experienced a strange peace and tranquil. A serene bliss emanated from within and radiated throughout his being as he stood with his eyes transfixed on the lingam. The merit of his past lives and the prodding from his destiny had sprouted in him an unquenchable love for Lord Shiva. Many had visited this temple before him and many did so after him too. But, Kannappa was among those rare few who got surcharged with divine love. From that day onwards, Kannappa became a regular at the temple. Lord Shiva in the form of that lingam became his companion and confidante. Every night, once he finished his hunt, he would arrive at the temple and offer Lord Shiva a part of the spoils. Thus, he would place meat in the holy sanctum sanctorum. The day which turned out to be a life-changing one for Kannappa, proved to be a life-changing one for the temple priest too. For, from that day on, whenever he arrived to the temple in the morning he would find it defiled with meat, blood and wine. Cursing the sinner who was indulging in such activity, he would clean the temple, take a bath, bring flowers for worship, offer naivedyam of fruits and then leave. Come evening and night, Kannappa would enter the temple and begin the worship. He wished to bathe the lingam but had no means of carrying the water. So, he would bring a mouthful of water from the nearby River Swarnamukhi and pour it on the lingam. Then he would make his offerings of meat, blood and wine. One morning, as the priest went about his sincere worship of the lingam and bewildered cursing for the perpetrator of the defiling, something wondrous happened. The lingam sprouted eyes and they opened! Seeing this, the priest was thrilled beyond imagination. Even as his thrilled body broke into a dance, something horrifying happened. The left eye of the lingam began to bleed. Starting as a trickle, the bleeding became very profuse. The whole eye seemed damaged. The priest was horrified. All his joy evaporated and he was convinced that this was an ill-omen. He felt that this happened because of the sinner who was defiling the temple every night. Instantly, he ran out of the temple and away from the forest with a promise never to step into the temple again. 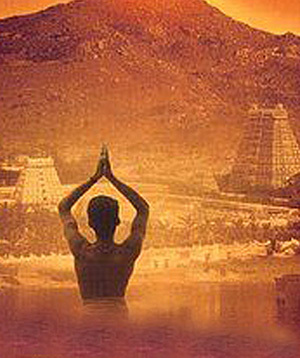 At nightfall, Kannappa came into the temple. The same sequence of events followed. But when Kannappa noticed the bleeding eye, he was overcome with severe pains of empathy. Saying so, he went into the forest and fetched some medicinal herbs to apply to the bleeding eye. All his efforts were to no avail as the bleeding continued relentlessly. 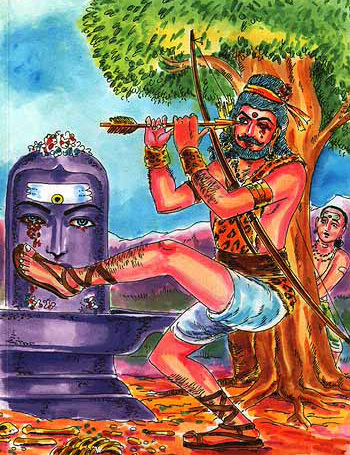 In what could be considered as great bravery, supreme devotion and a primitive transplant surgery, Kannappa plucked his one eye out with one of his arrows and placed it in the spot of the bleeding eye of the Shiva lingam. This stopped the bleeding in that eye of the lingam and Kannappa was very happy. His joy was short-lived as, soon after, the second eye too began to bleed! This suddenly complicated matters for Kannappa. No! It was not because he was hesitant to give up his other eye. It was because he thought that if he were to pluck his other eye too, he would become blind to exactly know the spot where he has to place his own second eye over the bleeding second eye of the lingam! And so, he placed his big toe on the bleeding eye as a marker and was about to plunge the arrow to gouge his second eye too. At this point, Lord Shiva appears and stops him from blinding himself. Needless to say, Kannappa was made wholesome in body, mind and spirit. From that day onwards, he has been worshipped as a Nayanmar saint. Innumerable are the times when Swami has stressed that the Lord is Bhaavapriya and not Baahyapriya. This translates into the Lord being a lover of feelings and not the one interested in the show that is put on. The priest and the hunter were both equally dear to Him. And so, He showed Himself to both! 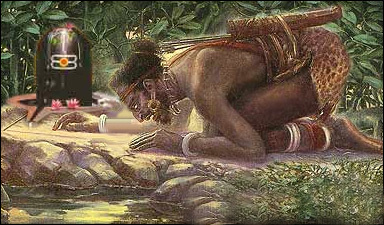 But, the uncivilized, defiling hunter evidently had greater love for the Lord! He was ready to give up even his eye for the Lord’s sake. His Lord mattered to him more than himself. Devotion does not mean performing worship and offering flowers to God. Worship amounts to good actions alone. One should have good thoughts within. One will not be redeemed if one undertakes good actions with bad intentions. For instance, if someone offers a donation of 10 lakh for a charitable cause, another person may come forward with a donation of 15 lakh only to attract public attention. In reality, he may not give even 10 rupees. Such people are heroes at platform and zeroes in practice. There should be unity in thought,word, and deed. All That the Lord Inspires us to do Through Love for Him – Give up the ‘I’! We are ready to offer so many things to the Lord. We are ready to make sacrifices – food, water, comforts. But are we ready to give up this ego - the ‘I’ that we hold so dear to ourselves? The story shows that the instant we give up the ‘I’, the Lord manifests and makes us wholesome in every sense. In fact, in the same discourse quoted above, Swami mentions on how giving up this ego which manifests as attachment is the only way to liberation. Today, some people advocate the need for bhajans, charity, and service, saying that they confer moksha (liberation). If they really believe in what they are saying, why don’t they practice what they preach? It is easy to preach, but difficult to practice. Moha kshayam is moksham (total detachment is liberation). Attachment leads to suffering. So first and foremost, give up attachment. Many have come to know of the story of Kannappa through a Kannada movie of the same name. The movie’s protagonist, Kannappa, was played by a debutant actor. Is it mere coincidence that the actor who began his acting career with this movie turned out to be the greatest icon of the Kannada movie industry? Yes! Dr. Rajkumar made his debut with this movie. Association with thoughts, feelings and things so noble and sublime surely have a halo effect. If you think that this was just a coincidence, how about this fact – Dr. Rajkumar lent his name to an Eye Bank (Dr. Rajkumar Eye Bank, Narayan Nethralaya) and also promoted its cause. And he also willed both his eyes as a donation to the blind. What better way to serve the Lord than with his eyes!